Damage to podocytes is a central pathomechanism of proteinuric kidney disease. However, it is not fully understood how podocyte injury evolves to progressive glomerulopathies such as FSGS or collapsing glomerulopathy. In particular, the role of parietal epithelial cells remains controversial. Here, we show that adriamycin induces DNA damage and podocyte lysis in mice without evidence of autophagy, endoplasmic reticulum stress, or necroptosis. After extensive podocyte loss, activated parietal cells mediated tuft re-epithelialization by two distinct mechanisms. In the majority of glomeruli, vacuolized parietal epithelial cells attached to denuded glomerular basement membrane and, occasionally, disengaged from the parietal basement membrane. Less frequently, parietal epithelial cells covered the denuded visceral basement membrane via formation of proliferative pseudocrescents. Notably, “visceralized” parietal epithelial cells did not express vascular endothelial growth factor but upregulated hypoxia-inducible factor 1 expression. The presence of visceralized parietal epithelial cells in sclerosing and collapsing lesions in a kidney biopsy from a patient with diabetes underscores the human relevance of our findings. In conclusion, repopulation of the glomerular tuft by parietal cells may represent a compensatory response to extensive podocyte loss. Our results suggest, however, that visceralized parietal epithelial cells cannot induce revascularization of the hyalinized tuft, resulting in hypoxic cell death and irreversible destruction of the glomerulus. FSGS and collapsing glomerulopathy represent related but morphologically distinct patterns of progressive glomerular injury.1 They are generally classified as podocytopathies, but are also seen secondary to other glomerular diseases. Damage to podocytes, specialized terminally differentiated cells, which form an integral part of the kidney filter, is the morphologic hallmark of proteinuria.2 Several attempts were made to explain the evolution from podocyte injury to progressive glomerulopathies,3 including the causative involvement of parietal epithelial cells (PECs), although it is unclear whether a PEC response perpetuates or resolves glomerular injury.4 PECs may serve as a stem cell reservoir for podocytes under physiologic conditions,5 whereas inappropriate activation of PECs was proposed to injure the glomerular filter.6 Another hypothesis proposes a migratory and proliferative podocyte phenotype, which directly results in adhesions and extracapillary proliferations.7 Regardless of such conflicting concepts, the questions of when and how these processes contribute to progressive glomerular injury have not been sufficiently addressed. Here, we used adriamycin (ADR) nephropathy as a mouse model of FSGS to examine the effects of podocyte injury/loss on PECs, to define the role of PECs in resulting glomerular lesions, and to determine whether PEC activation is detrimental or beneficial.8 We show that ADR induces both sclerosing and collapsing glomerular lesions in the same kidney, and we identify two distinct pathways of PEC activation after extensive podocyte loss. To examine dose dependency of ADR nephropathy, mice on a mixed Balb/c C57Bl6 background were intravenously injected with ADR at a low dose (11 µg/g body weight), intermediate dose (17 µg/g body weight), or high dose (22 µg/g body weight). Saline-injected mice served as controls. Albuminuria in saline-injected mice remained at baseline (17.9±2.6 µg/24 h) until 4 weeks after injection (19.9±8.0 µg/24 h). ADR caused dose-dependent albuminuria, with a peak at 2 weeks in mice injected with the low ADR dose (11 µg ADR–injected group) (8268±2824 µg/24 h) and a peak at 1 week in mice injected with the intermediate ADR dose (17 µg ADR–injected group) (13,632±2200 µg/24 h). Albuminuria in the 17 µg ADR–injected group dropped to 9294±3456 µg/24 h at 2 weeks (Figure 1A). The high ADR dose (22 µg) induced severe albuminuria (16,335±5838 µg/24 h) within 1 week. Of note, mice in the 11 µg ADR–injected group showed substantial recovery of proteinuria to low levels at 4 weeks (585±231 µg/24 h). ADR exposure was associated with body weight loss, which became statistically significant in all ADR-injected groups as early as 2 weeks after injection (Figure 1B). The low ADR dose (11 µg) caused 25% lethality by 4 weeks, and >60% of mice in the 17-µg ADR group died within the first 2 weeks (Figure 1C). The high dose of ADR (22 µg) caused severe morbidity and lethality within the first week (Figure 1C). 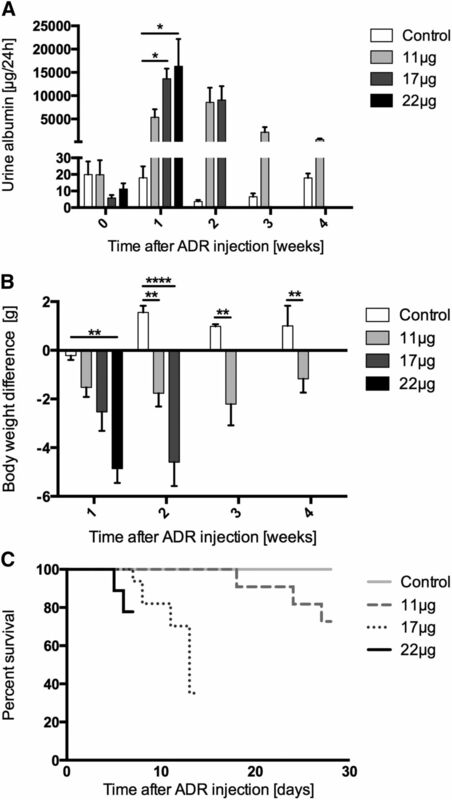 Due to the high mortality rate, severity of weight loss, and overall poor body condition, the surviving mice in the 22 µg ADR–injected and 17 µg ADR–injected groups were euthanized after 1 and 2 weeks, respectively. 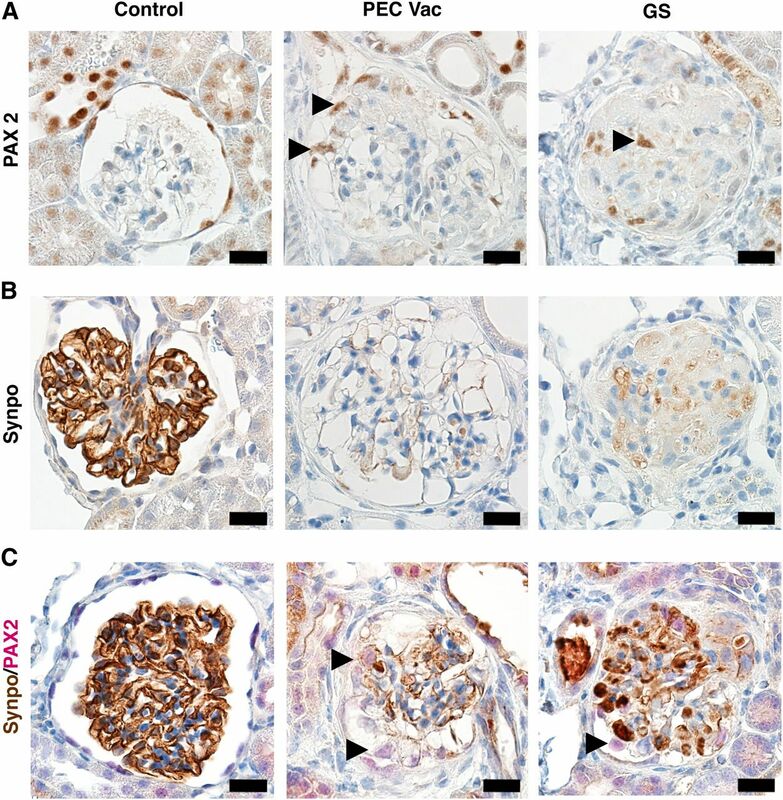 Albuminuria results from glomerular filter damage2; therefore, we investigated how histologic changes correlate with proteinuria and disease progression in ADR nephropathy. 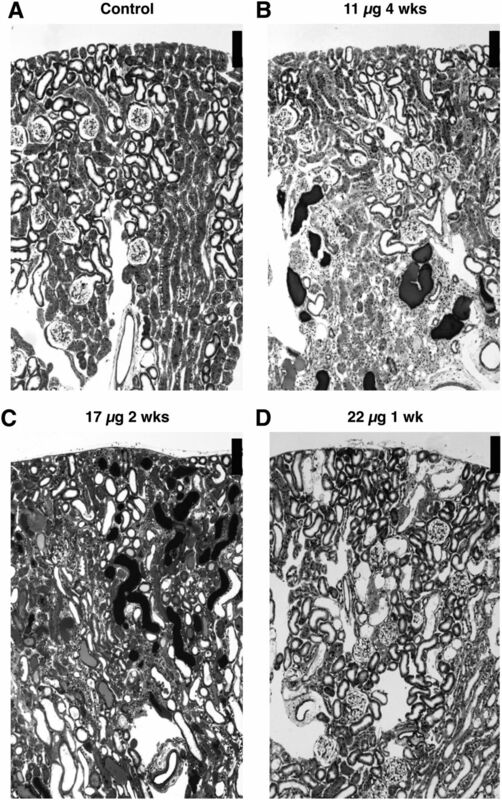 Whereas control kidneys showed no light microscopic changes at 4 weeks (Figure 2A), kidneys of mice in the 11 µg ADR–injected group showed focal loss of renal parenchyma with tubular atrophy, interstitial fibrosis, and scattered proteinaceous tubular casts (Figure 2B). Kidneys of animals in the 17 µg ADR–injected group showed markedly more tubular atrophy and proteinaceous casts at 2 weeks (Figure 2C). In contrast, kidneys of surviving mice in the 22 µg ADR–injected group showed acute tubular necrosis (ATN) at 1 week (Figure 2D). Overview of histologic changes in the renal cortex in ADR nephropathy. (A) Control mouse kidney 4 weeks after injection of saline. The renal cortex is preserved with normal glomerular and tubulointerstitial architecture. (B) Mouse kidney 4 weeks after injection of 11 µg ADR. The renal cortex shows mild chronic changes with proteinaceous casts and focal atrophy of the renal parenchyma. Only isolated glomerular changes are seen. (C) Mouse kidney 2 weeks after injection of 17 µg ADR. The renal cortex shows moderate chronic changes of the tubulointerstitium with tubular atrophy and frequent proteinaceous casts. Many glomeruli demonstrate pathologic changes. (D) Mouse kidney 1 week after injection of 22 µg ADR. The renal cortex shows only few glomerular lesions; the majority of tubules demonstrate severe ATN, characterized by low epithelium and epithelial cell necrosis. Scale bar, 100 µm. A detailed quantitative analysis of glomerular lesions showed the following. In control mice, 100% of glomeruli were preserved (Figure 3A, Supplemental Figure 1A). In the 11 µg ADR–injected group, 86%±7.1% of glomeruli were preserved (Supplemental Figure 1B). Some glomeruli (4.2%±3.0%) showed striking PEC vacuolization (Figure 3B). Few chronic glomerular lesions were evident, including 1.8%±0.7% segmental glomerulosclerosis (SGS) and 7%±3.9% global glomerulosclerosis (GS) (Figures 3, C and D, respectively). A small fraction of glomeruli (1.0%±0.5%) revealed epithelial cell proliferation on the tuft as segmental pseudocrescent formation (PCF) (Figure 3, E and F). In kidneys of mice in the 17 µg ADR–injected group, only 36.7%±16.4% of glomeruli were preserved at 2 weeks (Supplemental Figure 1C), whereas most glomeruli showed substantial damage, including GS (32.8%±12.32%) and SGS (1.8%±0.9%). Compared with the 11 µg ADR–injected group, a markedly larger fraction of mice injected with 17 µg ADR demonstrated PEC vacuolization (22.7%±5.5%). Some glomeruli showed epithelial PCF (6%±2.7%), notably also in a higher percentage than in the 11 µg ADR–injected group. Although the tubulointerstitium in kidneys of mice injected with 22 µg ADR showed severe ATN, the majority of glomeruli were light-microscopically normal (92%±4.9%); only 3.5±2.4% of glomeruli exhibited vacuolated PECs, and 2.5%±1.3% and 1.5%±1.0% were segmentally and globally sclerosed, respectively. The spectrum of glomerular lesions in ADR nephropathy. (A) Light-microscopically normal glomerulus. Exclusively normal glomeruli are found in control mice, and represent the majority of glomeruli in all ADR-injected animals at 1 week. In contrast, few normal glomeruli are observed in 17 µg ADR–injected animals at 2 weeks. (B) Glomerulus with parietal epithelial cell vacuolization (PEC Vac). Asterisks mark large vacuoles in PECs, spanning from the parietal basement membrane to the glomerular tuft. (C) Glomeruli with sclerosed segments are a frequent finding in ADR-injected animals and are absent in controls. (D) Glomeruli with GS are frequent in 17 µg ADR–injected animals at 2 weeks, whereas they are rare in other ADR-injected groups and absent in controls. (E and F) Glomeruli with single-layered PCF (E) and multi-layered PCF (F). Epithelial cell proliferations covering a collapsed tuft, reminiscent of collapsing glomerulopathy, are encountered in 17 and 22 µg ADR–injected animals. The arrow points to an epithelial bridge (E), and the asterisk marks a multi-layered pseudocrescent (F). Scale bar, 20 µm. To explore the development of the glomerular lesions observed in the 17 µg ADR–injected mice observed at 2 weeks, we quantified early histologic changes at 1 week (Supplemental Figure 1E). At this time point, only few glomerular lesions were present: 90.7%±5.0% of glomeruli appeared normal by light microscopy, 2.4%±0.8% showed SGS, 1.6%±0.5% exhibited GS, and 5.3%±4.1% showed PEC vacuolization. In contrast, pseudocrescents were absent. Thus, high proteinuria at 1 week precedes the development of glomerular lesions. ADR intercalates directly into DNA.9 To examine whether DNA damage contributes to ADR-induced podocyte injury, we analyzed the expression of histone 2AX (H2AX), a marker of double-stranded DNA breaks,10 by immunohistochemistry. Whereas glomeruli of control mice showed only minimal expression of H2AX, ADR-injected mice (17 and 22 µg) showed strong H2AX labeling at 1 week (Figure 4, A and B). The number of H2AX-positive cells markedly decreased at 2 weeks, reflecting loss of damaged podocytes or subsequent DNA repair. Immunohistochemical analysis of early glomerular changes. (A) Immunoperoxidase staining for H2AX in controls, and in 17 µg ADR–treated mice at 1 week. The controls show minimal glomerular staining, whereas strong specific staining is present in occasional tubule cell nuclei. In glomeruli of ADR-injected mice, intense nuclear staining is present in podocytes and weak staining is seen in endothelial cells. (B) Quantification of H2AX-positive tuft cells per glomerulus. The increase in H2AX-positive tuft cells compared with controls is statistically significant in animals treated with 17 and 22 µg ADR at 1 week (****P≤0.001); this increase is not statistically significant at 2 weeks and does not differ from controls in animals injected with 11 µg ADR. (C) Representative images of immunoperoxidase staining for BiP in controls, and in 17 µg ADR–treated mice at 1 week. No statistically significant difference in glomerular staining is present (data quantification not shown). (D) Representative images of immunoperoxidase staining for LC-3 in controls and in 17 µg ADR–treated mice at 1 week. Although autophagosome staining was observed in distal tubules, glomeruli are negative for LC-3 in controls as well as in ADR-injected mice. n=50 glomeruli per animal. Scale bars, 20 µm. To explore putative roles of endoplasmic reticulum (ER) stress and autophagy in the pathogenesis of ADR nephropathy, we studied the expression of the ER stress chaperone binding immunoglobulin protein (BiP) and the autophagosome marker light chain 3 (LC-3).11,12 The number of BiP-positive cells was not different between controls and ADR-injected mice at any time point analyzed (Figure 4C). Of note, whereas specific LC3-staining was present in distal tubular cells, glomeruli from control or ADR-injected mice were negative for LC3 (Figure 4D). We next examined ADR-induced glomerular injury by transmission electron microscopy (TEM). Control kidneys showed healthy podocytes with normal foot processes (FPs), intact slit diaphragms, regular glomerular basement membrane (GBM), and fenestrated endothelium. Podocytes showed normal nuclei, organelle composition, and cytoskeleton, and were devoid of vacuoles (Figure 5A). In contrast, podocytes of ADR-injected (17 and 22 µg) mice showed widespread FP effacement (FPE) after 1 week (Figure 5B). Effaced podocytes were firmly attached to the GBM, but often contained cytoplasmic vacuoles (Figure 5C). Several podocytes demonstrated beginning cell lysis with rupture of the plasma membrane and leakage of cytoplasmic content, or complete cell lysis (Figure 5D, left and right, respectively). In contrast, PECs were intact. We observed segmental podocyte dropout with denuded GBM at 2 weeks in the 17 µg ADR–injected group. In contrast, low-dose ADR (11 µg) induced only focal FPE, irregular GBM thickening, and segmental loss of endothelial fenestrations. Although podocyte FPE was a global response to ADR, only a subpopulation of podocytes underwent cell lysis. Podocyte lysis occurred in the absence of any PEC changes, suggesting that podocyte loss precedes a PEC response. 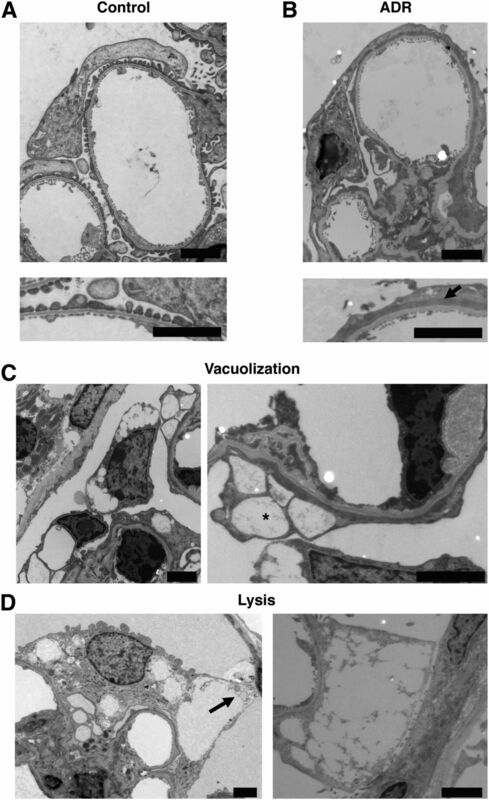 Ultrastructural changes of the glomerulus in ADR nephropathy. (A) Representative electron micrograph of a control glomerulus. 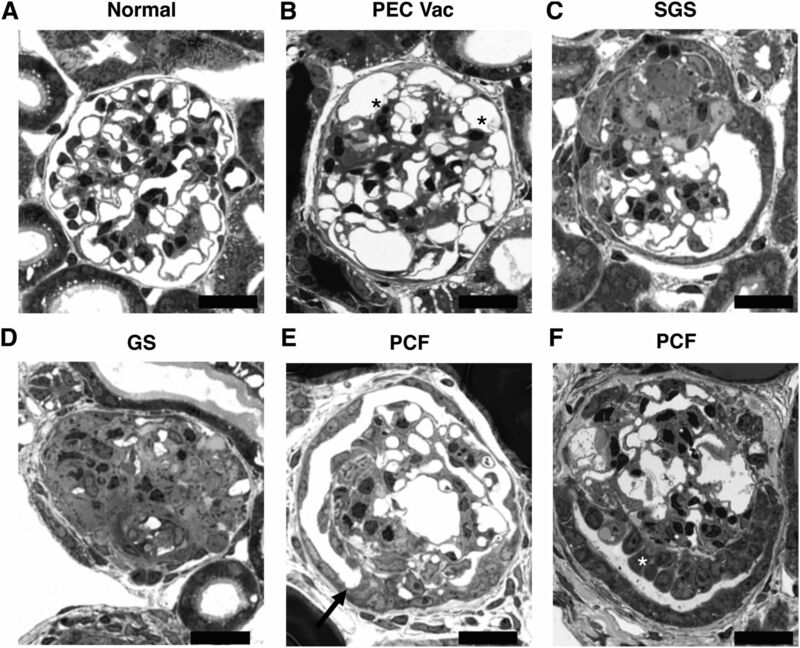 The architecture of the kidney filter is normal, with preservation of podocyte FPs with intact slit diaphragms, regular GBM, and fenestrated glomerular endothelium (lower panel). Podocyte cell bodies and primary processes show normal-appearing nuclei, organelle composition, and cytoskeleton, and are devoid of vacuoles. (B) Representative electron micrograph of a glomerulus at 1 week after injection of 17 µg ADR. Podocytes show extensive FPE and irregular thickening of the GBM. Notably, the typical cytoplasmic actin condensation is seen along the GBM (lower panel, arrow). (C) Representative electron micrograph of a glomerulus at 1 week after injection of 17 µg ADR with focal podocyte vacuolization. Effaced podocytes show vacuolization of their cytoplasm (asterisk), whereas the parietal epithelium is still intact. Note the presence of the dense actin band, typical for podocyte FPE, along an irregularly thickened GBM. Endothelial fenestrations are absent. (D) Left panel: representative electron micrograph of an injured podocyte at 1 week after injection of 17 µg ADR. Note the focal rupture of the podocyte plasma membrane, leaking cytoplasmic content into Bowman’s space, indicative of beginning cell lysis. Right panel: representative electron micrograph of a lysed podocyte at 2 weeks after injection of 17 µg ADR. Occasional podocytes show complete cell lysis. Scale bar, 2 µm. Cell lysis is a hallmark of necrotic cell death. We induced ADR nephropathy in rip3-deficient (rip3−/−) mice to examine whether ADR-induced podocyte lysis is mediated by necroptosis, a RIP3-dependent cell death mechanism (Supplemental Figure 2, A and B).13,14 Although rip3 deficiency improved survival, albuminuria and body weight were comparable to wild-type (WT) mice (Supplemental Figure 2, C–E). The distribution and severity of glomerular lesions were also similar to WT mice (Supplemental Figure 3A), indicating that RIP3-mediated necroptosis does not play a role in ADR glomerulopathy. rip3−/− mice injected with a high ADR dose (22 µg) still developed ATN (Supplemental Figure 3B), suggesting that ATN resulting from ADR is also RIP3 independent. The observed difference in survival between rip3−/− and WT mice is likely due to a RIP3-dependent effect of ADR in other organs. A large fraction of glomeruli (22.7%±2.5%) in the 17-µg ADR group showed extensive vacuoles in epithelial cells, which spanned Bowman’s capsule and connected to the glomerular tuft. To confirm the parietal cell origin of vacuolated cells, we studied these glomeruli by TEM (Figure 6). Virtually all vacuolated parietal cells were located opposite of denuded GBM, and demonstrated an activated phenotype with large nucleoli and chromatin margination. Most of the cells bridged Bowman’s space and attached to denuded GBM (Figure 6A). Occasionally, they were disconnected from the parietal basement membrane, leaving a gap in the PEC layer (Figure 6B). We also found hyalinized capillaries covered by cells with morphologic features of PECs (Figure 6C). PECs form giant vacuoles spanning across Bowman’s space and attach to the denuded glomerular tuft. (A) Representative electron micrograph of a glomerulus with tuft adhesion 2 weeks after injection of 17 µg ADR. In a subset of glomeruli, enlarged PECs (green, yellow, blue) bearing large nucleoli and giant vacuoles (asterisks) are spanning from the parietal basement membrane (PBM) (orange) across Bowman’s space to the opposite denuded GBM. (B) Representative electron micrograph of a glomerulus with tuft adhesion 2 weeks after injection of 17 µg ADR. In a subset of glomeruli, activated PECs (green) already adherent to the denuded GBM (pink) are partially detaching from the PBM (orange; arrow). (C) Representative electron micrograph of a glomerulus with segmental hyalinosis at 2 weeks after injection of 17 µg ADR. Hyalinized capillaries (double asterisks) with denuded GBMs (pink) are focally covered with epithelial cells (green, blue) with morphologic features of PECs. Note that the PBM (orange) is devoid of an epithelial layer. Scale bar, 10 µm in A; 2 µm in B and C.
To confirm that these cells were activated “visceralized” PECs (vPECs), and not podocytes, we performed immunostaining for the podocyte marker synaptopodin (synpo) and the PEC marker paired box 2 (PAX2).15,16 In control mice, glomerular PAX2 staining was limited to PECs (Figure 7A), whereas synpo showed intense podocyte staining (Figure 7B, left). Double labeling revealed mutually exclusive synpo and PAX2 staining (Figure 7C, left). In kidneys of ADR-injected mice, virtually all vacuolated cells were PAX2 positive (Figure 7, A and C, middle) but synpo negative (Figure 7, B and C, middle), thereby identifying them as PECs. 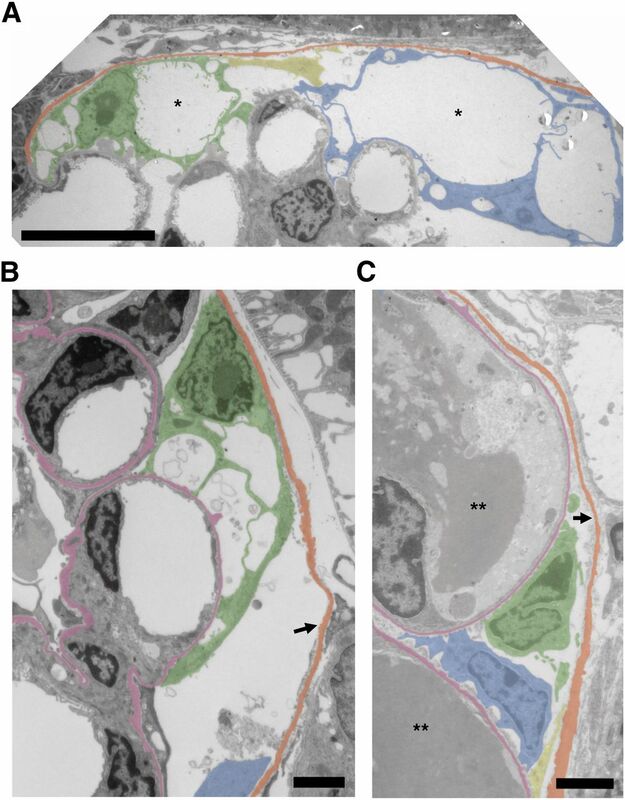 In globally sclerosed glomeruli, the few residual PAX2-positive cells (Figure 7, A and C, right) residing within the sclerosed tuft were synpo negative (Figure 7, B and C, right), confirming that they were vPECs. vPECs express PAX2 and are negative for synaptopodin. (A) Representative images of glomeruli stained for PAX2. PAX2 staining in control glomeruli is limited to the PECs; no specific staining is present in the glomerular tuft. In glomeruli with PEC vacuolization (PEC Vac), vacuolated cells, some of them attached to the tuft, show nuclear PAX2 staining (arrowheads). Globally sclerosed glomeruli exhibit scattered PAX2-positive cells within the sclerosed tuft (arrowhead). (B) Representative images of glomeruli stained for synpo. Controls show strong staining for synpo in podocytes. Only remnant podocyte synpo staining or nonspecific staining of large intracapillary hyalin deposits is present in glomeruli with PEC vacuolization or global sclerosis. (C) Representative images of glomeruli stained for synpo (brown) and PAX2 (red). The tuft in control glomeruli stains exclusive for synpo. PAX2 is only seen within the flat parietal epithelium. In glomeruli with PEC vacuolization, vacuolated cells are exclusively PAX2 positive, whereas synpo stains remnant podocytes in the tuft that are negative for PAX2. 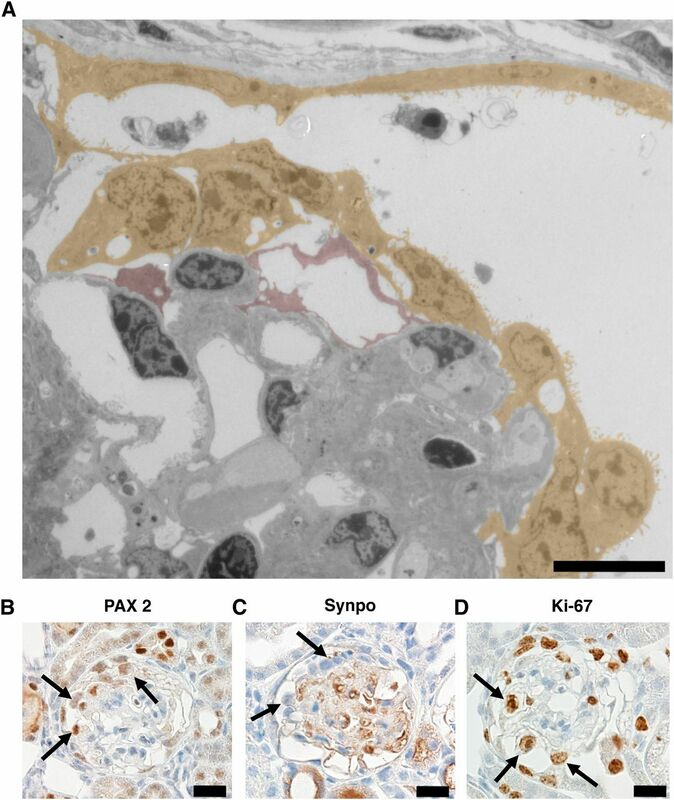 In global sclerosis, scattered cells in the glomerular tuft are positive for PAX2 (arrow), whereas nonspecific synpo staining is limited to hyalin deposits. Scale bar, 20 µm. vPECs form the proliferative pseudocrescents of collapsing lesions. (A) Representative electron micrograph of a glomerulus with a collapsed tuft segment and epithelial cell proliferation. The cells composing a single layer (orange), which is loosely covering a partially denuded tuft with only residual underlying podocyte coverage (red), show features of PECs. Note the open capillaries still covered by podocyte remnants. (B) Representative image of a glomerulus with a segmental epithelial cell proliferation stained for PAX2. The staining is limited to the parietal epithelium and palisading cells cover the glomerular tuft (arrows). (C) Representative image of a glomerulus with a segmental epithelial cell proliferation stained for synpo. The staining is negative in the palisading cells covering the tuft (arrows), whereas residual podocytes within the tuft are positive. (D) Representative image of a glomerulus with parietal cell vacuolization stained for Ki-67. Activated vacuolated cells show strong nuclear staining for Ki-67 (arrows), indicating cell cycle entry. Scale bar, 10 µm in A; 20 µm in B–D. Finally, we started exploring why vPEC-containing glomeruli proceed to irreversible scarring. We hypothesized that, in contrast to podocytes, vPECs do not produce vascular endothelial growth factor (VEGF) required for the development and maintenance of glomerular capillaries.18 In keeping with this, normal glomeruli showed strong VEGF expression in podocytes (Figure 9A). In contrast, glomerular tufts with GS or PCF were largely devoid of VEGF staining (Figure 9, B and C, respectively). Conversely, vPECs in GS (Figure 9B) and PCF (Figure 9C) strongly expressed hypoxia-inducible factor 1 (HIF-1), a marker of hypoxia,19 which was not seen in healthy glomeruli (Figure 9A). vPECs are negative for VEGF but express high levels of HIF-1. (A) Control glomerulus stained for VEGF and HIF-1. Whereas VEGF expression is strong in podocytes (arrows), glomerular expression of HIF-1 is weak. (B) Glomerulus with GS stained for VEGF and HIF-1. VEGF expression in the sclerosed glomerular tuft is virtually negative. In contrast, scattered epithelial cells within the tuft are positive for HIF-1 (arrows). (C) Glomerulus with PCF stained for VEGF and HIF-1. VEGF expression in the cells forming the proliferative lesion is virtually negative, whereas they are strongly positive for HIF-1 (arrows). Scale bar, 20 µm. 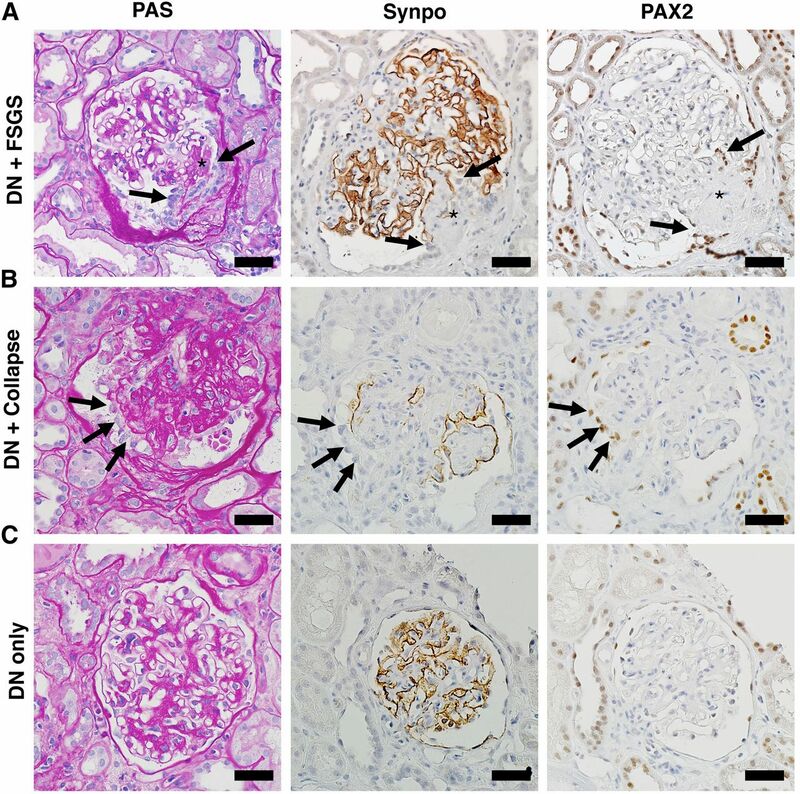 To explore the relevance of these findings for human disease, we performed immunostaining for synpo and PAX2 in secondary SGS and collapsing glomerular lesions in a biopsy from a patient with diabetic nephropathy. We found segmental loss of synpo in the area of sclerosis. In contrast, PAX2 staining was restricted to the sclerotic lesion, suggesting that vPECs replaced lost podocytes (Figure 10A). A collapsed glomerulus showed global reduction of synpo and presence of palisading synpo-negative, PAX2-positive vPECs populating the collapsed tuft (Figure 10B). In contrast, glomeruli with diabetic mesangial changes showed intact synpo staining and absence of PAX2-positive vPECs (Figure 10C). 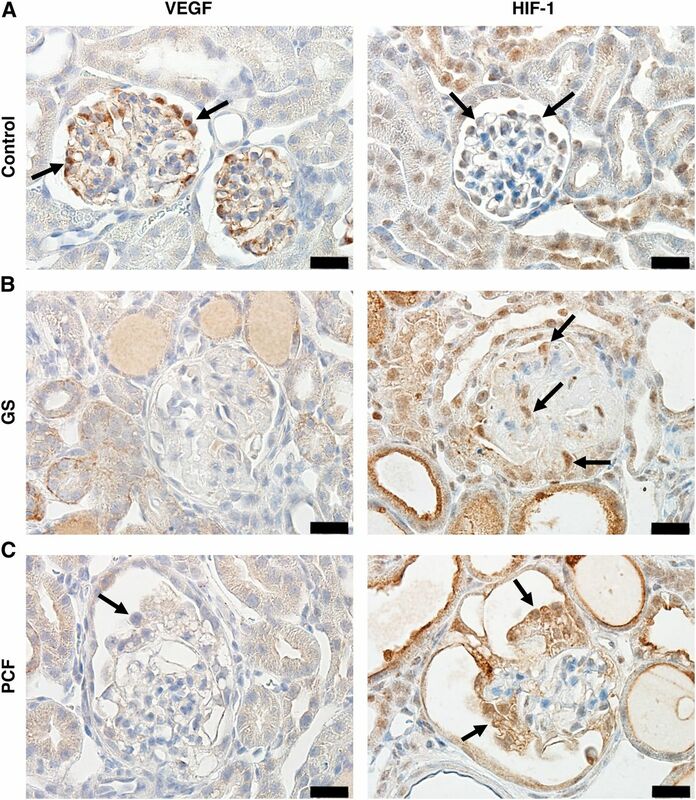 Moreover, similar to mice, both normal human glomeruli and segmentally sclerosed glomeruli were negative for LC-3 (Supplemental Figure 4) and showed no difference in tuft staining for BiP (Supplemental Figure 5). Renal biopsy from a patient with diabetic nephropathy (DN), and superimposed segmental sclerosis or glomerular collapse in the same sample, stained with periodic acid–Schiff, and for synpo and PAX2. (A) Glomerulus with mesangial expansion and SGS. The sclerosed segment (asterisk) shows loss of synpo staining and PAX2-positive, synpo-negative vPECs lining the tuft (arrows). (B) Glomerulus with a globally collapsed tuft. The collapsed tuft is repopulated by synpo-negative, PAX2-positive vPECs (arrows). (C) Glomerulus with mesangial expansion only. Note the intact podocyte staining for synaptopodin and absence of PAX2-positive vPECs on the tuft. Scale bar, 50 μm. This study shows that ADR causes dose-dependent proteinuria and mortality in mice. High doses of ADR are acutely toxic, induce early, massive proteinuria due to podocyte lysis, and lead to both sclerotic and collapsing glomerular lesions within the same kidney in surviving mice. Acute podocyte injury and lysis in ADR nephropathy are not mediated by ER stress, autophagy, or necroptosis. Moreover, we found no evidence of autophagy in podocytes contrary to previous reports.20 After podocyte dropout, PECs are recruited to the denuded glomerular tuft in an attempt to replace lost podocytes and possibly reduce further protein loss. Reactive oxygen species and the receptor for advanced glycation end products were implicated in podocyte injury in ADR nephropathy.21,22 Future studies will be required to test whether DNA damage occurs upstream, downstream, or in parallel with reactive oxygen species production. 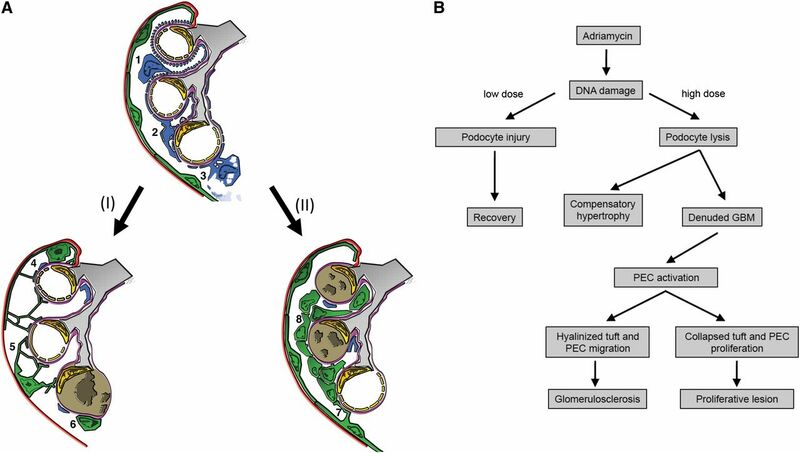 In addition, the glomerular endothelium is known to be an early target of ADR.23,24 Although this is an important finding, this study aims at specifically describing ADR-induced podocyte damage and ensuing progressive glomerular injury. The relationships between sclerotic and collapsing patterns of glomerular injury and the contribution of PECs are controversial.1 Previous studies suggested that podocyte dedifferentiation and proliferation contribute to collapsing lesions, whereas inappropriate activation of PECs was implicated in the pathogenesis of FSGS.4,6,7 Most recently, tracer studies by Moeller et al. emphasized the significance of PECs for glomerular pathobiology and identified PECs as a stem cell reservoir for physiologic podocyte turnover.4,5,25 These findings have sparked a new discussion on whether PEC activation under pathologic conditions is beneficial or detrimental. Our results now point to a targeted activation and recruitment of PECs to areas of denuded GBM, aimed at replacing podocytes, possibly in an attempt to reduce proteinuria and prevent further tuft injury. Although these changes can also be seen at later stages of ADR nephropathy, the predominant early manifestations described here follow another pathogenic and morphologic pattern. In contrast to single podocyte dropout in the classic model, ADR induces more widespread podocyte lysis after DNA damage. The rapid and extensive loss of podocytes in ADR nephropathy triggers a massive PEC response, leading to the recruitment of activated PECs to areas of denuded GBM. Of note, this PEC recruitment can occur via two distinct pathways, involving vacuolization leading to glomerulosclerosis, or PEC proliferation resulting in proliferative PCF (Figure 11). Although both pathways are induced by extensive podocyte loss, the molecular cues serving as a stimulus for PEC activation remain to be established. Pathways of re-epithelialization of the tuft by vPECs after podocyte dropout in sclerosing and proliferative glomerular lesions. (A) Schematic chain of events leading to tuft sclerosis or proliferative glomerulopathy: (1) normal epithelial coverage by podocyte FPs (blue) in a healthy glomerulus, (2) stress leads to podocyte FPE, and (3) localized podocyte lysis leaves behind areas of denuded GBM. These events can trigger one of two different pathways. Pathway I is as follows: (4) PECs (green) vacuolize to span Bowman’s space and attach to the denuded GBM, (5) PECs detach from the parietal basement membrane, and (6) a fully detached vPEC is covering aspects of a hyalinized capillary wall. Alternatively, in pathway II, the GBM denudation triggers proliferation of PECs across a small epithelial bridge (7) onto the denuded tuft, forming a pseudocrescent (8). (B) Model of pathologic events in ADR nephropathy. Adriamycin causes DNA damage in podocytes. Low doses lead to mild podocyte injury with FPE, followed by recovery of the visceral epithelium. High doses of ADR lead to podocyte lysis, whereas remaining podocytes attempt to compensate by hypertrophy. However, if too many podocytes drop out, denuded GBM is left behind, enabling extensive protein leakage. This in turn activates PECs, which either directly migrate onto the hyalinized tuft, eventually leading to glomerulosclerosis, or continuously proliferate along the denuded tuft to cover a collapsed glomerular segment. Another outcome of this study was the observation that vPECs in ADR nephropathy do not express VEGF but show high levels of HIF-1 expression, indicating hypoxia. As Eremina et al. elegantly showed, podocyte-specific expression of VEGF is required for the development and proper maintenance of glomerular capillaries.18 Whether the observed hypoxia is due to lack of VEGF expression and leads to a failure of these cells to induce glomerular revascularization remains to be addressed. Our results identify DNA damage as the underlying cause of massive simultaneous podocyte injury. ER stress and autophagy are not involved in the pathogenesis of ADR nephropathy. Necroptosis, a pathway leading to programmed cell death, does not play a role in ADR-mediated toxic podocyte lysis. Moreover, in contrast to studies by Linkermann et al.,28 who recently identified necroptosis as a mechanism of cell death in ischemic and cisplatin-induced renal injury, rip3−/− mice still show severe acute tubular injury after high-dose ADR injection, indicating that ADR-induced ATN is not caused by RIP3-mediated necroptosis. In addition, chronic tubular changes such as tubular atrophy and cystic dilation of tubules are not preventable by rip3 deficiency. The reparative response after parenchymal loss, such as that seen in tubular atrophy, is usually driven by activation and proliferation of adjacent dormant fibroblasts.29 Due to its specialized structural and functional properties, a comparable cell reservoir is not available in the glomerulus. Our results raise the intriguing possibility that PECs may serve as “functional fibroblasts” to replace lost podocytes. Generalized insults to all podocytes occur in human disease as well. Collapsing glomerulopathy is an idiopathic process or an acute complication of HIV, cytomegalovirus, or parvovirus infection,30–32 and is also seen in patients undergoing bisphosphonate treatment.33 Some variants of primary FSGS also show diffuse podocyte injury with global vacuolization of epithelial cells.34 In their primary form, both patterns of glomerular injury are characterized by massive proteinuria, but can also occur secondary to a variety of glomerular diseases with chronic podocyte damage and lower-grade proteinuria such as diabetic nephropathy. Our results in human biopsies suggest that the two pathways described here may be triggered by extensive podocyte injury in human disease and may contribute to the development of glomerular lesions. In conclusion, our study unveils the activation and recruitment of PECs in response to podocyte loss from DNA damage in murine ADR nephropathy. We suggest that although this may form a temporary patch for the leaky filtration barrier, the failure of vPECs to express VEGF may ultimately contribute to hypoxic cell death and promote hyalinosis. The Brigham and Women’s Hospital Institutional Review Board approved collection and immunostaining of human renal biopsies. Four-micrometer paraffin-processed, formalin-fixed kidney sections were stained with periodic acid–Schiff or, after antigen retrieval (pressure cooker or microwave in citrate buffer, pH 6), with antibodies against H2AX (rabbit pAb, 1:200; Abcam), synaptopodin (mouse mAb, 1:10),15 PAX2 (rabbit pAb, 1:75; Invitrogen), BiP (rabbit pAb, 1:500; Cell Signaling Technology), LC-3 (rabbit pAb, 1:100; Abcam), VEGF (goat pAb, 1:200; R&D Systems), or HIF-1α (rabbit pAb, 1:100; Cayman Chemical), followed by horseradish peroxidase–conjugated secondary antibodies (Dako), and counterstained with hematoxylin. One-micrometer sections of resin-embedded tissue were stained with toluidine blue. Images were taken with an Olympus BX53 microscope with DP72 camera and processed using Adobe PhotoShop software. Ultrathin 80-nm sections of resin-embedded kidney tissue were mounted on copper grids, treated with uranyl acetate and lead citrate, and examined by a pathologist (A.W.) in a blinded fashion using a JEOL 1010 transmission electron microscope. Histology of five animals from each group was assessed. Periodic acid–Schiff, toluidine blue–stained sections and electron micrographs were analyzed in a blinded fashion by A.W. or S.H. and classified using standard criteria. For objective quantification of positively stained tuft cells, a custom application for ImageJ software was used. Briefly, positive cells were counted with an ImageJ macro (color threshold: red, 1–243; green, 119–148; blue, 129–185) that provided differentiation between positive and negative cells. Particles with an area >200 pixels2 were selected. Localization of positive cells to glomeruli and final counting was done in an overlay picture (Supplemental Material). Results are expressed as the mean±SEM and assessed by Dunnett’s multiple comparisons test (ANOVA) using GraphPad Prism software. RT-PCR on whole-kidney mRNA was performed according to standard protocol using primers specific for RIP3 (FP-5′-ACCTGAAGGCTTCTAAAGCG-3′, RP-5′-GTCTTGTCTACCAACTCAGC-3′). RT-PCR for glyceraldehyde 3-phosphate dehydrogenase was performed as a control and showed equal loading. We thank Terri Woo, Colleen Ford, Brant Douglas, and Svetlana Andreeva for excellent technical assistance. We also thank Dr. Vishva M. Dixit (San Francisco, CA) for generously providing rip3−/− mice, and Dr. Helmut Rennke (Boston, MA) for helpful discussions. S.H. is supported by a research stipend from the Deutsche Forschungsgemeinschaft (HA 6334/1-1). A.C., T.S., and D.B. are supported by student fellowship stipends from Boehringer Ingelheim Fonds. P.M. and A.W. are supported by grants from the NIH National Institute of Diabetes and Digestive and Kidney Diseases (DK57683, DK062472, and DK091218 to P.M. and DK093378 to A.W.). This article contains supplemental material online at http://jasn.asnjournals.org/lookup/suppl/doi:10.1681/ASN.2013070687/-/DCSupplemental.